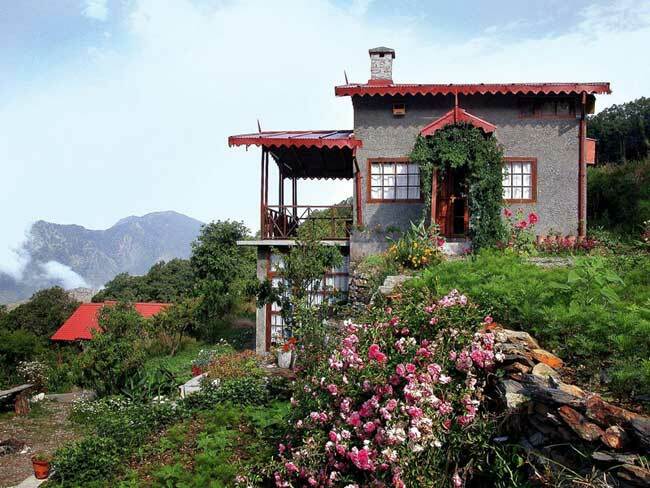 Jungle Lore Birding Lodge is a deluxe 5-cottages hotel in Pangot (near Nainital). One of the cottages is a living room that serves as a common dining hall giving travelers a chance to meet other like minded nature lovers. The Jungle Lore Birding Lodge is located in the northwestern forest range of Nainital is the village of Pangot, surrounded by thick oak and rhododendron forest on three sides the lodge, it is a typical Kumaoni hill settlement with about 15 families. You can still observe the age old lifestyle of the hill folk in Pangot. There are more than 250 species of birds recorded in the area. One can have excellent birding opportunities in the lodge itself. Besides, there are numerous walks through the terrace fields into thickly wooded oak forest which are extremely rewarding. There are good trails from the lodge to Timla Pani, Ggughu Khan, Kilbury Forest Rest House and on to Cheena Peak. The guide may accompany you on these treks (prebooking required). Once you reach Pangot Village, a guided walk of 5 minutes (by locals) will lead you to the Jungle Lore Birding Lodge. You can see many birds while this small walk to the resort. 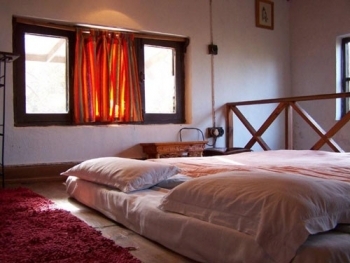 The cottages in Jungle Lore Birding Lodge are independent bedrooms with twin beds. Two of them have wooden attics and each attic can accommodate two-three additional persons. The cottages are located on different terraces; each one has its own sit-out area. Heaters are provided in each cottage during winters. The rooms have attached toilets with running hot and cold water. Cheer Cottage: As soon as one descends into the parking area from the main road and walks down 10 steps, one reaches Cheer Cottage. The cottage is equipped with a double bed, a wooden attic with two separate floor mattresses, en suite toilet with a WC and a hot shower, a wooden verandah overlooking the valley and the garden. Bucket and mugs are provided in the toilet for wash up if the water pressure is less in the shower or faucet. The size of the room is about 15’x18’. Koklas Cottage: Walking down 20 steps from Cheer Cottage past the dining room, one reaches Koklas Cottage. The cottage is equipped with a double bed, en suite toilet with a WC and a hot shower, a small sit-out facing the jungle and the garden. Bucket and mugs are provided in the toilet for wash up if the water pressure is less in the shower or faucet. The size of the room is about 11’x12’. Khalij Cottage: Walking down 20 steps from the dining room, one reaches Khalij Cottage. The cottage is equipped with a double bed, an extra bed, en suite toilet with a WC and a hot shower, a sit-out facing the approach path & the jungle. Bucket and mugs are provided in the toilet for wash up if the water pressure is less in the shower or faucet. The size of the room is about 14’x16’. Magpie Cottage: Walking down 15 steps from the Khalij Cottage, one reaches Magpie Cottage. The cottage is equipped with a double bed, a wooden attic with two separate floor mattresses, en suite toilet with a WC and a hot shower, an enclosed verandah facing the approach path & the jungle. Bucket and mugs are provided in the toilet for wash up if the water pressure is less in the shower or faucet. The size of the room is about 12’x14’. The kitchen serves a variety of scrumptious traditional Indian homemade meals and they are happy to customize dishes according to your preferences. Special care is taken in hygienic preparation of all meals. The dining area is just 10 steps from Cheer Cottage, it also serves the purpose of a restaurant. The buffet meals are served when there is a full house at the lodge. A la carte meals are served on prior order as per the menu. The menu consists of Indian and Kumaoni dishes (cuisines). Note: The resort discourage the use of pre-packaged food items and bottled water as it adds to pollution and is additional cost for disposing it to Haldwani. The guests may get their own food items as per their preference and are requested to take away as much non-biodegradable material with them. - Bird Watching: More than 250 species of birds have been recorded in the Pangot area. - All tariffs are in Indian currency and are exclusive of all taxes. - Rates are subject to change without any prior notice. - To and Fro transportation can be arranged at an extra cost. - An advance of 100% is required. - No Refund in case of road block, accidents, snow fall, no show etc. - 50% of the total refundable amount (as per the above policy) will be released within 30 days of cancellation and the balance 50% will be adjusted into the future bookings. - It can sometimes be quite chilly outdoors at night, even in summer, so do dress warmly. The snow is expected during winers. - There is no inhouse laundry, but same can be managed in the village with extra charges. - The power supply is 220V and the plug size is Standard English. The power supply in Pangot can be very erratic. - There are no power backups, as electricity generators cause sound and atmospheric pollution, which can harm birds. - Smoking is not recommended in and around the lodge, inside the cottages and in the dining areas. - The smaller mammals, wild animals & birds occasionally do enter and pass through the lodge. Guests are requested not to walk alone at night. - Monkeys and and Langurs visit the lodge too. Please ensure that you keep eatables away from them. - We advise you to be careful with your valuables. If there is something you would like to keep safe, the manager will be happy to assist you. - Pangot does not have a bank to change foreign currency. The nearest ATM is in Nainital, 15 km from Pangot. - Credit cards are accepted, kindly carry enough cash to pay for hotel taxes and any extra expenses that you may incur. By Train: Overnight air-conditioned train from Old Delhi railway station (departing at 2235 hr.) to Kathgodam (arriving at 0615 hr.) and then 2 hr. drive to Pangot via Nainital. OR Overnight air-conditioned train from Old Delhi railway station (departing at 2235 hr.) to Ramnagar (arriving at 0500 hr.) and then 2Â½ hr. drive to Pangot via Kaladungi.